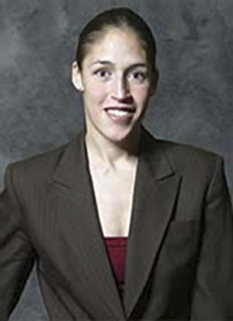 Rebecca Lobo was born on October 6, 1973 in Southwick, Massachusetts. 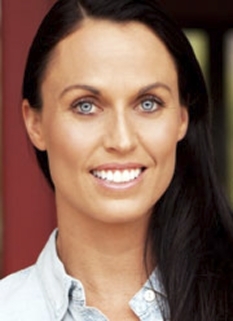 Lobo is a television basketball analyst and a former player in the Women's National Basketball Association (WNBA) from 1997 to 2003. Lobo, at 6' 4", played the center position for much of her career. Rebecca Lobo holds the state scoring record with 2,710 points in her high school career in Southwick-Tolland Regional High School in Massachusetts. 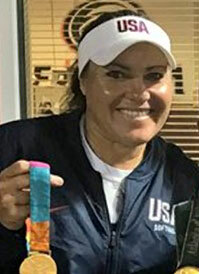 Lobo attended the University of Connecticut and helped lead the Huskies to the 1995 National Championship with an undefeated 35-0 record. 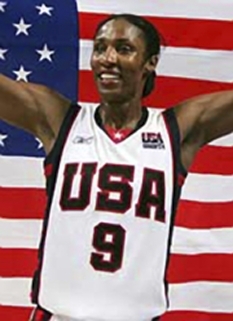 In her senior year, she won the 1995 Naismith and College Player of the Year award. After college, Lobo joined the WNBA for its inaugural season. 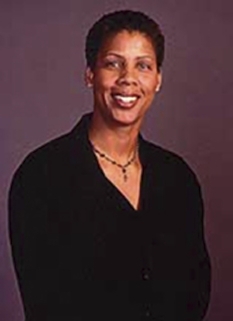 Lobo was assigned to the New York Liberty during the league's first player allocations on January 22, 1997. She spent the first five years of her career with New York. However, in the first game of the 1999 season, she grabbed a rebound and as she landed she tore the anterior cruciate ligament in a nasty injury to her left knee where her entire lower leg bent inwards at a 50 degree angle and never fully recovered. Today, Rebecca Lobo is seen as a reporter and color analyst for ESPN with a focus on women's college basketball and WNBA games. Rebecca Lobo is the youngest daughter of Dennis and Ruth Ann Lobo. Her father is half Cuban and half Polish. Her mother is of German and Irish heritage. Her brother Jason played basketball at Dartmouth College. Her sister Rachel played basketball at Salem State College. She is married to former Sports Illustrated writer Steve Rushin. On December 25, 2004 Rushin and Lobo had their first daughter named Siobhan Rose Rushin. Their second daughter, Maeve Elizabeth Rushin, was born on August 10, 2006. She is now pregnant with their third child. In 1996, Rebecca Lobo and her mother, Ruth Ann Lobo, collaborated on a book entitled The Home Team, which dealt with Ruth Ann's battle with breast cancer. Lobo was the 1996 spokesperson for the Lee National Denim Day fund raiser which raises millions of dollars for breast cancer research and education. DISCLAIMER: PFP Sports Talent Agency does not claim to represent itself as the exclusive agent for Rebecca Lobo. PFP Sports Talent Agency is a booking agency that represents organizations seeking to hire pro athletes and sports personalities such as Rebecca Lobo for speaking engagements, personal appearances, product endorsements and corporate entertainment. Fees on this website are estimates and are intended only as a guideline. Exact fees are determined by a number of factors, including the location of event, the talent’s schedule, requested duties and supply and demand. PFP Sports Talent Agency makes no guarantees to the accuracy of information found on this website and does not warrant that any information or representations contained on this website will be accurate or free from errors. We are often asked how can I find out who is Rebecca Lobo's agent? To find Rebecca Lobo appearance fees and booking agent details, you can contact the agent, representative or manager through PFP Sports Talent Agency for speaking fee costs and availability. PFP Sports Talent Agency can help your company choose the ideal sports personality for your next marketing campaign. To hire Rebecca Lobo for an appearance, speaking event or endorsement, contact Rebecca Lobo's booking agent for more information.